Like coconuts? If yes, then have you tried coconut rice? Love it?! 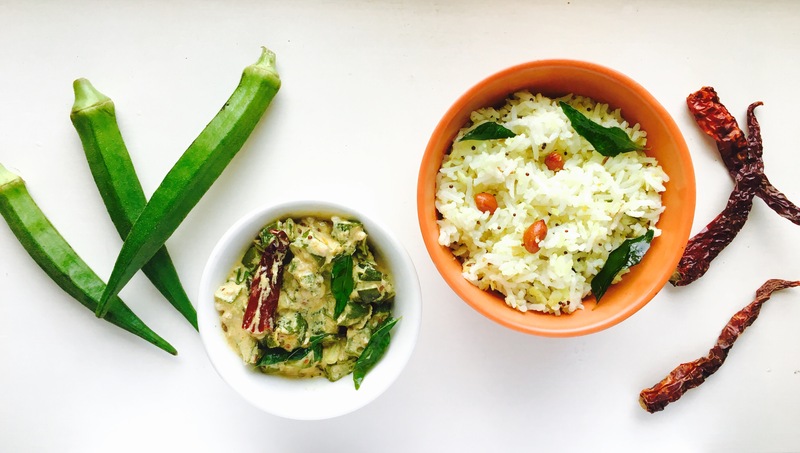 Here’s a simple South Indian version from my kitchen to your’s!! It’s share-worthy because its simple and I really enjoyed both – cooking and eating it… Its one of those recipes to keep on file for a busy week as its quick, fun & full of flavour, I promise! Now, into a utensil on medium heat, add a teaspoon of oil and fry the okra for 10 mins or until the stickiness evaporates, sprinkle some salt, this will help expedite the process. While this is cooking, to a mixing bowl add the yogurt and mix in the powdered spices – cumin, turmeric, coriander and red chilli powders and set aside.Once the okra is cooked store in a bowl to add in later. Then turn the heat down to the absolute minimum and add the yogurt combined with spices that you set aside earlier, allow to warm for 2 minutes and turn off the heat. Now add in the okra, season with salt, mix well. To a wok on medium heat, add oil once hot, temper with cumin seeds, mustard seeds, green chillies, groundnuts, ginger and curry leaves. Fry for about a 30-40 seconds. To this add the rice and mix well. Season with salt and serve hot! Tip: You could add a teaspoon of gram flour to the yogurt along with the other spice powders before you cook it, this will avoid the yogurt from splitting while heating it 🙂 While adding the dried red chillies to the oil, just break them in half using your fingers, this helps them infuse their flavour to the oil while cooking!